Northamptonshire batsman Kyle Coetzer became the first Scottish player to hit World Cup century, although it wasn’t enough to prevent a defeat to Bangladesh in Nelson. The 30-year-old brought up his ton with one of his four sixes and also struck 17 fours in his record-breaking knock of 156 as he helped Scotland reach 318-8. But Bangladesh produced the second-highest successful run chase in a World Cup game as they clinched a six-wicket victory on 322-4 with 11 balls to spare thanks, in the main to Tamim Iqbal’s 95 . The result means Scotland can no longer qualify for the knockout stages after they tasted a fourth defeat in as many matches in Pool A. But it was still a day to remember for Coetzer as his knock came from 134 balls. He put on 78 with Matt Machan (35) and then 141 with captain Preston Mommsen as Scotland reached their big total. 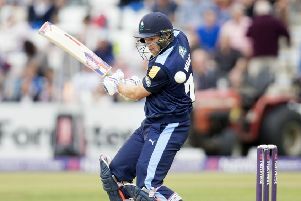 Coetzer’s century was his second in one-day international cricket and the second-highest individual score for Scotland in all one-day internationals with the record currently held by Calum MacLeod who hit 175 against Canada last year. Scotland still have matches against Sri Lanka and Australia to come while their defeat means England will have to beat Bangladesh on Monday if they are to keep their own hopes alive.